2018 Kawasaki Ninja 400: Exclusive Dyno Run and Measured Weight! 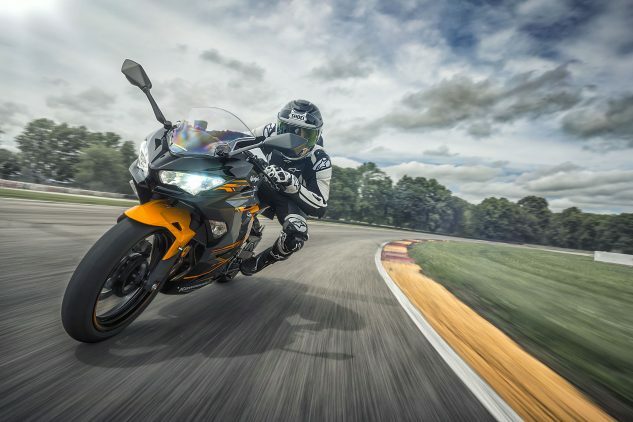 Kawasaki’s all-new Ninja 400 is ready to upend the small-displacement sportbike category by offering the triumvirate of appealing motorcycle characteristics: class-leading power, a reasonable price, and swanky good looks. At a base MSRP of $4,999, the new 400 retails for the same price as the previous Ninja 300, and the 400 is also endowed with a seriously attractive profile. But we already knew that when the Ninja 400 was announced. What we can exclusively report now is the Ninja 400 produces more power than anything in its class, cranking out a considerable 44.0 horsepower at its rear wheel. Its torque is also healthy, at 25.0 lb-ft when run on the Dynojet 250i at our friend’s shop, Mickey Cohen Motorsports. 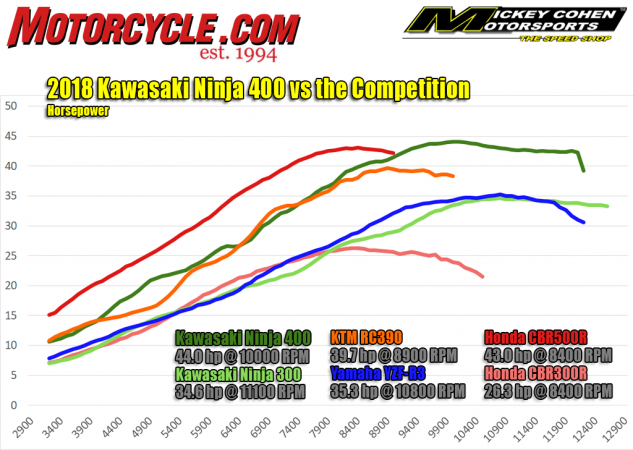 Exclusive Ninja 400 dyno run shows a lot of ponies and an impressively flat torque curve from its 399cc parallel-Twin motor. That’s nearly a 30% increase in horsepower over the Ninja 300! Of course, the Ninja 400 is armed with more engine displacement than all but one of its rivals, so it brings a size advantage to the table. But a bike with a bigger engine and similar weight priced at the same or similar MSRP threshold is a net gain. 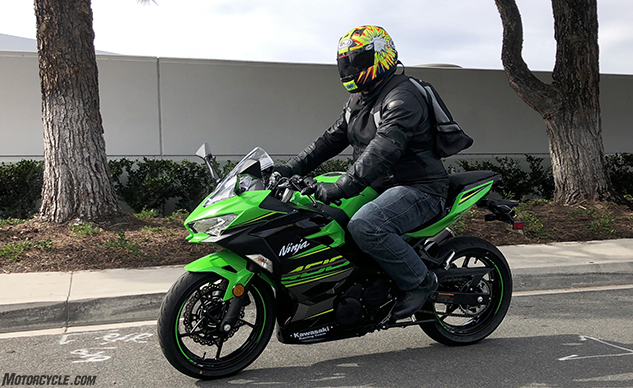 Full of fuel (3.7 gallons), the ABS-equipped Ninja 400 scaled in at 366 pounds, which compares favorably to the claimed wet weight of the 321cc Yamaha R3 ABS (375 lbs) and 384-lb Ninja 300 (with 4.5 gallons of fuel). 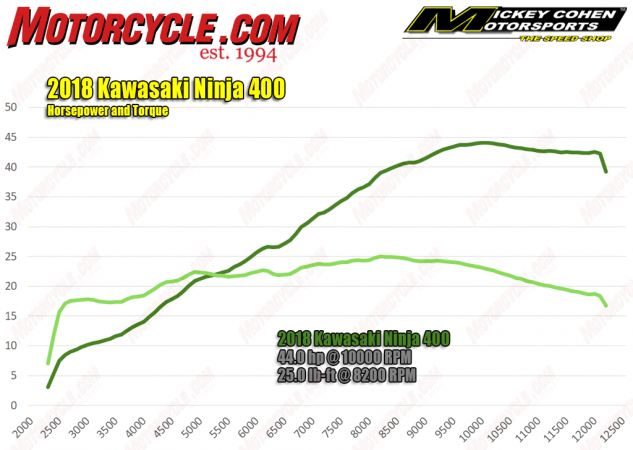 The dominance of the Ninja 400’s engine (dark green trace) is evident in this horsepower chart, dwarfing its 300cc competition and revving to a top-end pull that even surpasses the output of Honda’s 471cc CBR500R. 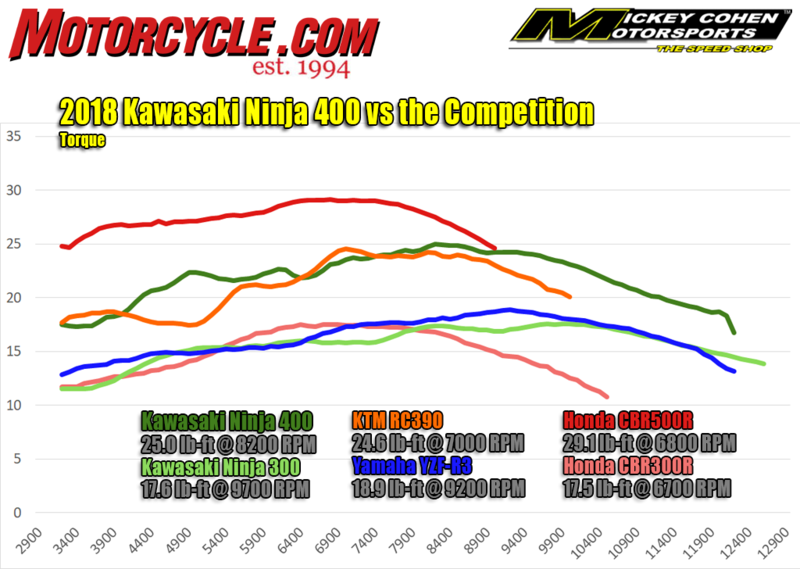 Note also how the Ninja keeps pace or exceeds the 373cc Single of KTM’s RC390. Perhaps most appealing is how Kawasaki was able to hold the line on pricing, selling for the same MSRPs as the Ninja 300, at $5,299 for ABS. The sharp-looking KRT edition colorway retails for $5,499 and includes ABS. For context, Yamaha’s base-model R3 also retails for $4,999. Honda’s CBR300R is cheaper by $300 but is down an enormous 18 horsepower. The CBR500R, while close in power to the Ninja 400, costs much more ($6,599) and weighs a massive 59 lbs extra. KTM’s RC390 retails for $5,499 but includes ABS as standard, and it weighed 364 lbs last time we tested it. Small-displacement sportbike engines are generally known for weak torque production, but the Ninja 400 is going to change that assumption. In its brief time in our hands, the Ninja 400 was ridden only to and from the dyno by Sean Alexander, who, at 6-foot-2 and more than 250 lbs, isn’t the ideal candidate for a smaller sportbike. That said, Kawi’s 400 impressed him with its relative vigor, accelerating on an uphill freeway section to 105 mph while sitting upright. In a tuck on a downhill road, he saw 127 mph on the speedo and estimates an actual 120-mph top speed. He said it felt stable at speed but didn’t feel especially nimble. Brake feel, he says, was linear. The Ninja 400 is also available in this Pearl Solar Yellow/Pearl Storm Grey/Ebony colorway. While we never know for sure how a comparison test is going to turn out before we ride the bikes side by side, unless Kawi messed up the adroit handling of the Ninja 300, the new Ninja 400 is a solid bet to take the top honors in our 2018 Lightweight Sportbike Shootout. Our boy Ryan Adams will be testing the Ninja 400 on street and the racetrack this week, so be sure to stay tuned to MO for his report. Get price quotes for Kawasaki Ninja from local motorcycle dealers.